Happy New Year Everyone!!! How did you guys spend your new year? As usual, I spent New Years with my family then met up with my friends and partied hard all night long with Champaign and a lot of bar hopping. Holiday festivities are always fun! What was special about this year was having visitors from Japan and I am very excited to tell you all about it. January 1 usually entails being in bed all day long with a really bad hangover, a trash bin beside your bed and stuffing yourself with vitamin C but as I said, this year was different. My January 1, 2014 was all about the beach — Driving 3 hours down south to Oslob and taking a boat to SUMILON Island. 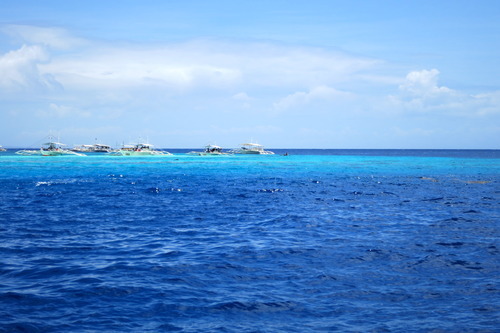 Yes, THIS is Sumilon — a very exclusive Island off the coast of Oslob. Our home for the next 3 days! 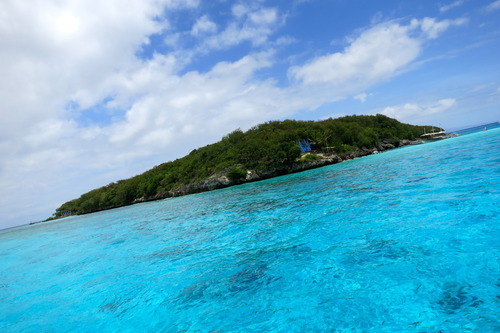 (Blue Waters Resort is the only resort in the island) Exciting isn’t it? Sunbathing with the smell of coconut sunblock on your skin, water on your feet, and a pinacolada to top it all off, it was perfect……BUT NO! Right when we got there, the weather was jealous of our 3 day mini vacation and decided to bring a storm to us! THANKS A LOT!